SHERYL AND I picked up some awesome books during our getaway last weekend. I have some quality biography reading coming up with books about my childhood hero, Ken Dryden, and Aerosmith guitarist Joe Perry. Also, if there is a better crime series out there than John Sanford's Prey books, please let me know. 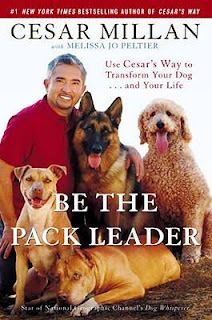 Sheryl bought a book by Cesar Millan called Be The Pack Leader. On Monday night, in the midst of the Calftown July 4 fireworks, Sheryl was trying to calm our border collie, Tucker, who hates loud noises. Then I walked into the room and immediately Tucker went nuts and became even more upset. As Millan explains, dogs feed off of energy and they can tell when you are in a bad mood or upset. In this case, I was feeling sorry for Tucker, and it only made the situation worse. It's all about being calm and assertive, and making sure everybody knows the pecking order in the pack. As usual, we learn more about ourselves when we learn about dogs. As soon as I quit feeling sorry for Tucker, he calmed down and became less stressed about the fireworks. Sheryl is trying to teach him better coping skills when the big bombs go off in the hood. In our world of video games, instant internet access and pretentious media indignity, finding a good book and getting lost in the pages is still the way to go. Simple theme. Theme images by RBFried. Powered by Blogger.